Here are the instructions and links you need for participation in today’s workshop. All the slides from the rpesentation today are uploaded in the post just below this one. 1. Create stories about the future of your own work, your institution or your students. 2. Reflect on the key forces influencing your area of interest. 3. Learn how others imagine the future of learning. 1. You will be given a link to a Google Map. 2. You will be given a starting location on the Google Map. 3. At the start of the game, open the Google Map from the link and find your starting location on it. 4. When you click on the location on the map, a bubble will open up containing a question you have to answer. 5. Answer the question in writing in a Word document on your computer. Make sure you save the document. 6. After you have answered the question, move to the next destination on the Google Map, which will be indicated in the question bubble. Good luck and we hope you will enjoy the workshop! We are looking forward to your future discoveries! Take part in the CALF workshop at the Learning Futures Festival 2011! Sandra RomenskaFTS: So, tell our delegates a little about yourself, Sandra? SR: I am a Research Associate with the Creating Academic Learning Futures (CALF) research project at the University of Leicester. My research interests are in the areas of futures studies, strategic foresight, learning and teaching technologies, innovation, international and comparative education. I have an MA in educational research from the University of Warwick and a DPhil in institutional innovation in higher education from the University of Oxford. FTS: And what will you be offering during our 2011 festival? I am running an online, interactive workshop that I’ve designed based on my research on the future of higher education. Do you want to get a glimpse of what the future of education might hold? Not satisfied with the future visions from your crystal ball or tarot cards? Then join the Fast Forward Workshop at the festival and try the scholarly approach to the future! FTS: Sounds like fun. What will the participants do? They will practise and learn how to use of a range of free, reusable and repurposable web-based innovative tools and methods for collaborative foresight. In a series of interactive exercises, they will engage in discussions of the key forces influencing education today and learn how to assess the likelihood of possible future trends. The workshop will offer a taster session in the use of a method developed by the CALF project for structuring problems in terms of causes and consequences. This will improve participants’ understanding of strategic options, knowledge and possibilities for innovation, available to their organisation. FTS: And does it matter that this workshop will be held online and not face to face? Now at all. In fact, you could argue that the online delivery is better as it fits the realities of the future of learning. With the range of tools available as part of Adobe Connect 8, in addition to traditional audio and video, participants will have a truly interactive learning experience, and never have to leave their desks. As Yogi Berra famously said once “The future ain’t what it used to be”; the Fast Forward workshop will try to figure out what the future could be. 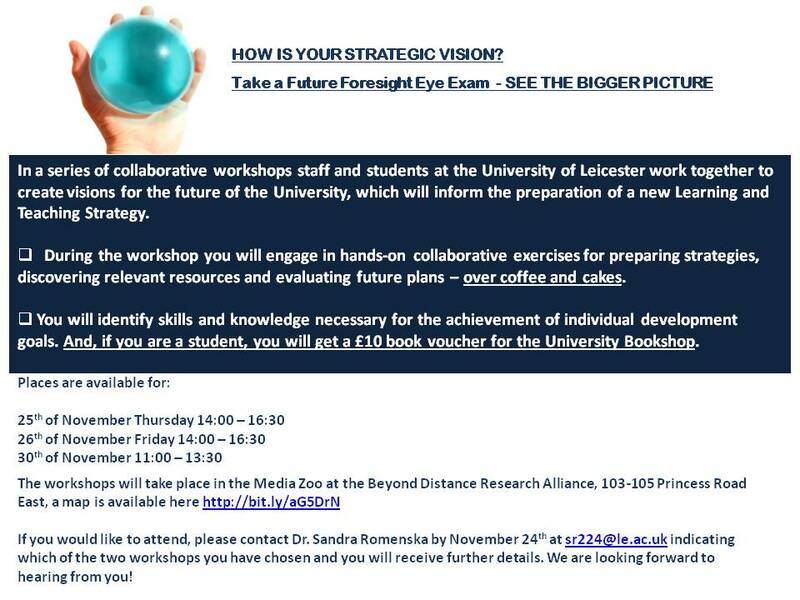 The consultation with staff and students on the new Learning and Teaching Strategy of the University of Leicester took place in the form of one workshop for staff and students, and six interviews with students. In addition, twelve questionnaires were completed by students. In total one member of staff and 21 students were consulted. The workshop aimed to find out answers to the question what students and staff feel is important for their learning and teaching. The interviews – why they feel it is important. The questionnaires aimed to find out what was felt to be more important and what was seen as less central. The University of Leicester as a diverse community of learning was seen as a distinctive characteristic relevant to learning and teaching. Interestingly, participants felt that their learning and teaching are supported by the interaction of two factors which are often meant to be opposites – diversity and community. Community implies common values and beliefs, i.e. the opposite of diversity. Participants believed that UoL is differentiated by its model of “celebrating diversity” and by University using diversity as a resource to build a “learning community of diversities” which students feel promotes learning. Examples of diversity given by students usually in contrasting pairs were: international students – home students; distance learners – campus-based students; students from different cultural and religious backgrounds, research students and taught-course students, students and staff, Students’ Union and university administration. •	Message for the Learning and Teaching Strategy: Diverse groups become a community when they are united in learning (as in shared desired academic outcomes and learning about each other through communication). Exposure to and learning about differences enables finding commonalities which was seen as enabling learning, adding to the learning experience and a desired learning outcome across academic disciplines. The new Strategy needs to reinforce and promote the link between diversity and learning. •	Action points: Institutional support for existing and promoting new ways for multi-way interaction among diverse groups. This can be achieved by identifying outcomes whose desirability would unite otherwise diverse groups and creating managed pathways for achieving them. Examples provided by participants: involving students in research done by lecturers (as partners, helpers, observers, “critical friends”, rather than “study subjects”); creating opportunities for distance learners and campus-based students to communicate and collaborate (through technology for example); bringing together international students and home students, but also international students from different geographical regions (participants felt that sometimes they are grouped within country of origin rather than across country or background in events, etc.). Emphasis on identifying shared learning outcomes and institutional support for achieving them through explicitly identifying, communicating and using diversity as a resource for learning. The consultation for the new Learning and Teaching strategy takes place in the form of workshops for staff and students. We are running two consultation workshops this week and one next week. The output of each workshop is summarised and incorporated into a report for the University Learning and Teaching Strategy working group. 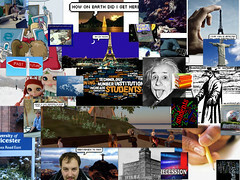 Congratulations to the September 2010 Futurists! Nine students from the Medical School of the University of Leicester successfully completed the three-week CALF Special Summer Component “Strategic Foresight”. This component, running for a second consecutive year, provides a rigorous introduction to a toolbox of methods for strategic foresight in medical care. It enables students to prepare not just for “best practices” but for the “next practice” in health care. Participating students learnt how and when to use creative strategy methods to anticipate events in their future medical career, and feed this knowledge into their daily decision-making and learning. Using fun and interactive online tools they identified employability pathways supporting their future career plans and identified skills that they need to develop. Let the revolution (in Medical Education) begin! And my whole-hearted gratitude to Nadir Patel for his amazing work in creating the video above!